I'm going to give blogging another go this year! So to start off, a bit of a tour of our new schooling area. We decided that a dedicated homeschool room didn't work well for us. We always end up taking everything upstairs near the couch because we like to be comfortable for read-alouds. Slowly everything migrates there and the homeschool room gets forgotten. We also decided we wanted somewhere more organized for our games. 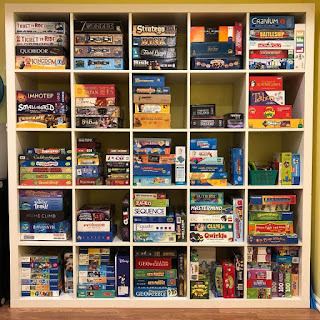 We play a lot of games and they were stored in various locations all over the house. So we made the school room into the play room. And the large playroom was converted into a new family area. 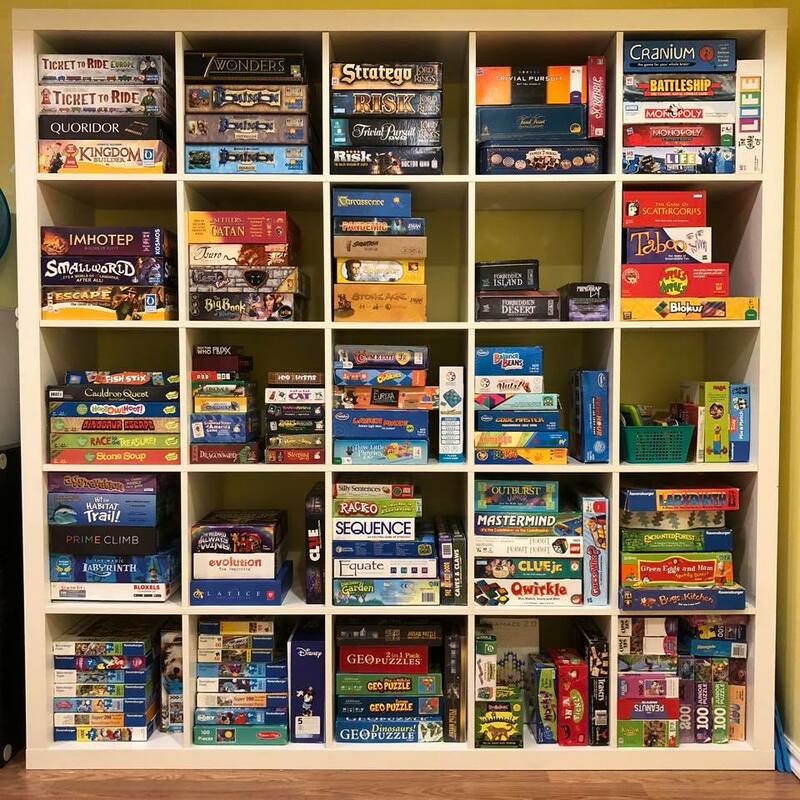 We started with getting all of our games into one organized place. I could look at this shelf all day! I love it! We added a futon couch so we can sit and read or play games, or we can lay it out for the girls to get comfortable when working on projects. Yay options. We got a new tv for upstairs so our old one will be coming down here soon. Against the wall is a folding card table and chairs. That's what we plan on using for games so we still have the option of having the space be open. Some cubbies for random stuff and the printer. Drawers and desks. Two of the drawers are turned backwards because they have my kids' names on the front. Most of what we use every day will be stored here. We have plenty of space and the desks are light, so we plan on often pulling them away from the wall to use more comfortably wherever. We have lots of open space to work with! I'm hoping with these options we can keep our school stuff contained and not migrate all over the house! I love doing school in various places, but we have a hard time getting all the stuff back home when we frequently use somewhere else. I'm sure we'll still take everything outside some days and often on the road, but hopefully we can keep it out of the main living areas upstairs!